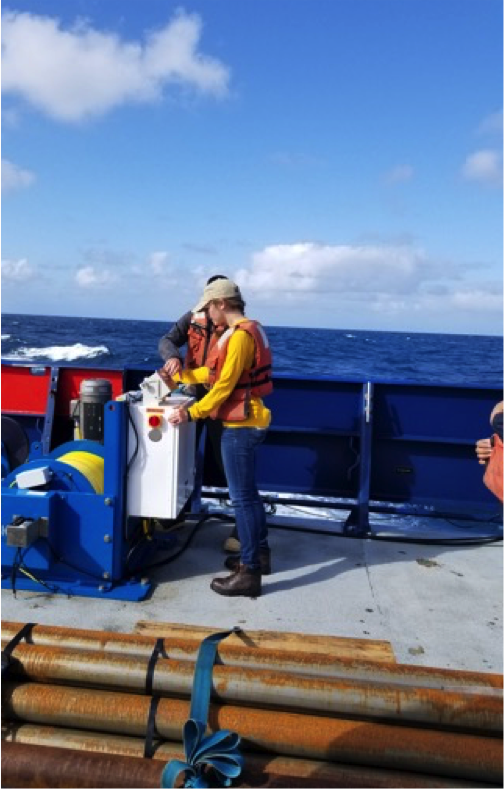 The primary objective of this experiment is to determine whether changes in seismic velocity or electrical resistivity across the fracture zone are a product of compositional or temperature variation between the lithosphere and asthenosphere. Map showing the large age offsets across the Mendocino and Pioneer Fracture Zones. Age contour interval is every 5 Ma. Red line shows track of the deployment of 21 MT/sesmic instruments. Transit tracks from Newport to San Diego are shown. Fracture zones are the perfect place to study thermal, resistive and compositional transitions between younger and older lithosphere. 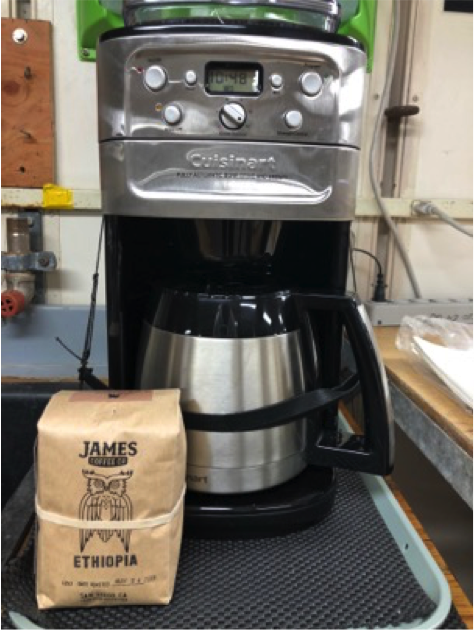 This is the main reason we decided to conduct the research cruise across the Mendocino FZ, at approximately 600 km away from the North America coast (figure 1). Contrary to faults, fracture zones represent the boundary between two plates that are moving in the same direction but are being created from two different spreading ridges (figure 2), and depending how far away you are from the crust formation, you will have a greater seafloor age difference. For instance, our study profile has a seafloor age difference of 27Ma according to previous studies (figure 3). Having this age contrast in the surface of the seabed translates into thermal and resistivity contrasts at greater depths as well. Nevertheless, studying the Earth at depths of more than tens of kilometers represents a challenge. Plate tectonics setting. Crust is being formed at two mid-ocean ridges connected by a transform fault. The Fracture zones are located in the areas where the plates are moving in the same direction, however they have different age. The further you are from the axis of the ridge, the greater contrast age. 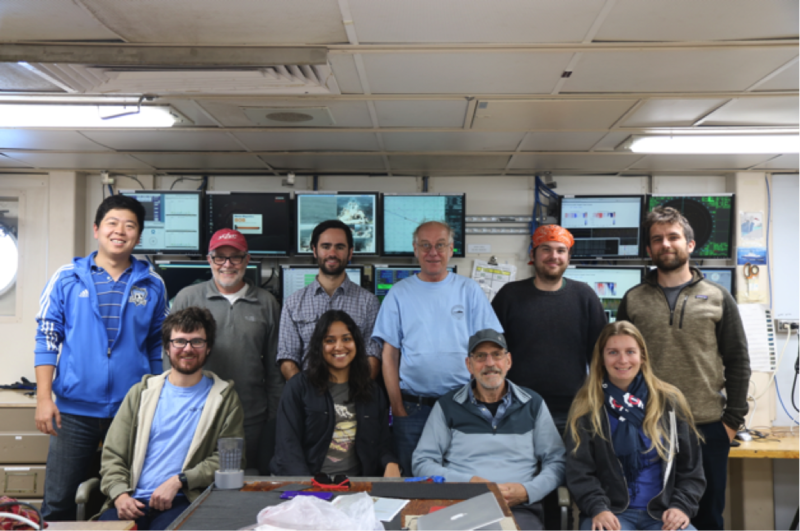 We deployed the seafloor instruments on the R.V. Roger Revelle in October 2017. (lower) Bathymetry map of the Mendocino and Pioneer Fracture zones. 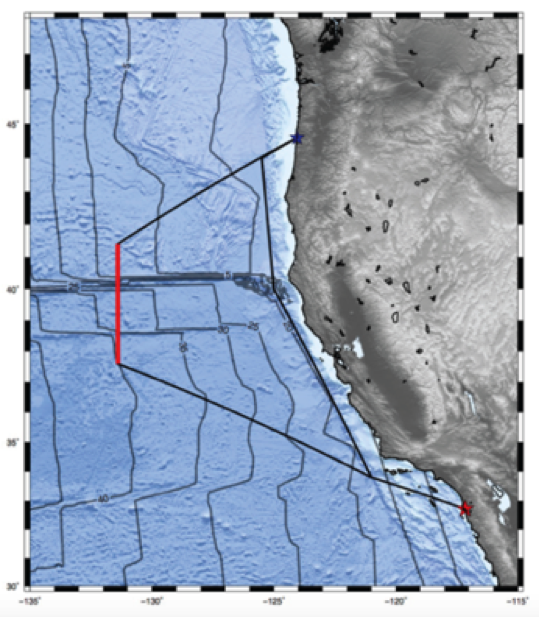 The dashed blue line shows the track of the deployment of 21 MT instruments and the red line shows the track of bathymetry, gravity and magnetics data collection. (upper) Bathymetry profile across the two fracture zones. The ages of the segments are labeled. 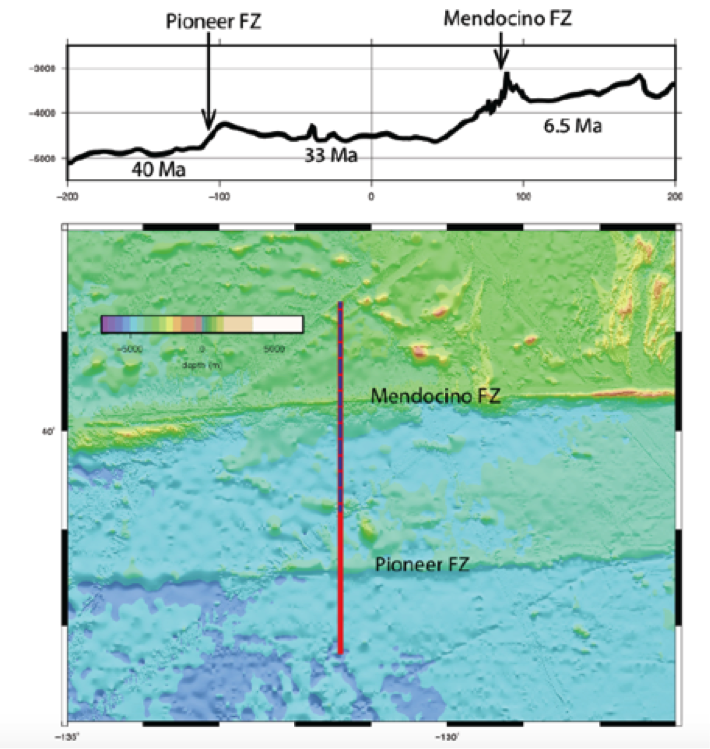 The Mendocino FZ has one of the largest age offsets on Earth of (26.5 Ma). Great times with the crew from UCSD and UCSC. From upper left to bottom right: Xiaohua Xu (Eric), David Sandwell, Ricardo Garza-Girón, Steven Constable, John DeSanto, Joel Edwards, Niel Foley, Valeria Reyes-Ortega, Eli Silver, Sarah Maher. The recovery cruise is in June 2018. This is the first time I (Valeria) get to be co-chief scientist. Ricky was super clever and brought a Mexican flag with himself; we are so proud to be Mexican. 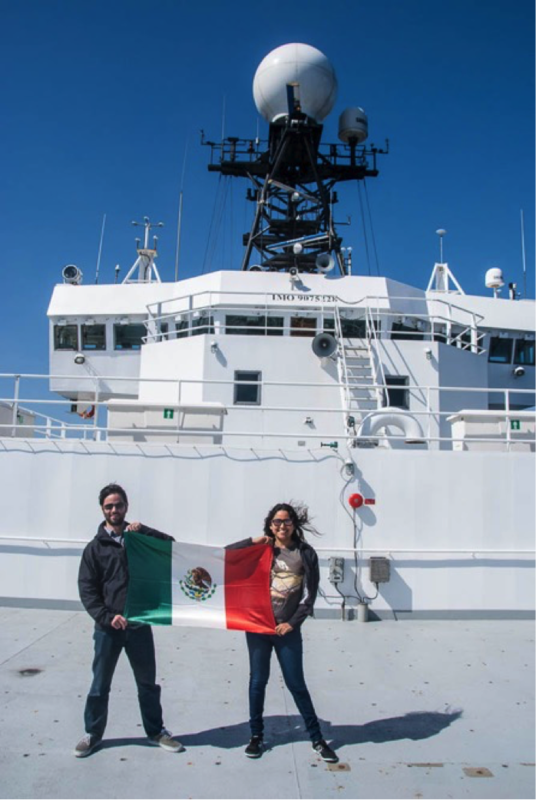 We are coming back to recover the instruments after 7 months. Everyone is very excited to start the journey. The Mendocino cruise consists of two parts. First, we will conduct the EM experiment, led by me, Valeria Reyes-Ortega, then we will start the Vibracoring project led by Boe Derosier and Drake Singleton. We also have the participation of undergrads from the STEMSEAS project which is very exciting for all of us. Everyone is adjusting to being out to the sea, especially those who have never been out previously. Advice for seasickness: Keep eating crackers and drink water or sprite to keep your stomach busy. The most important part of being on a vessel: SAFETY. 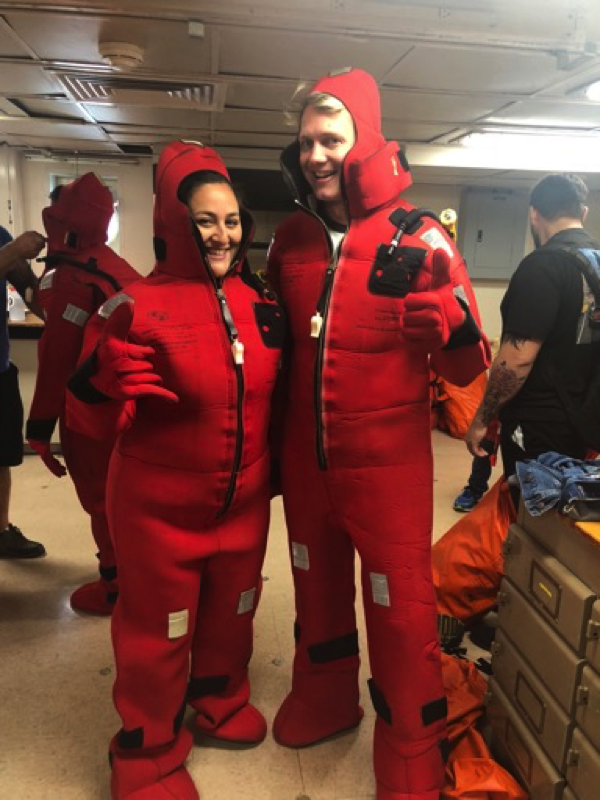 Jackie and Gabriel, STEMSEAS students, fitting up their survival suits for the drill. The second most important thing is coffee. Deploying the magnetometer. Controlling the winch is always a fun and empowering activity for the students! 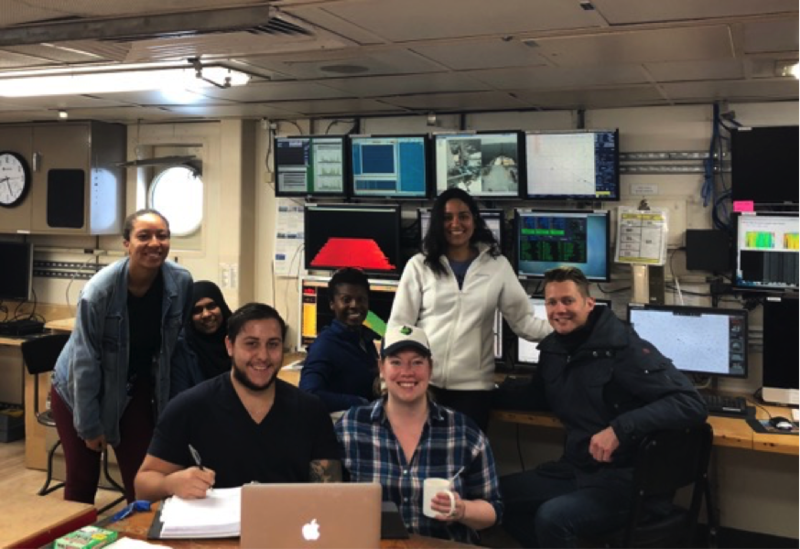 Getting students familiar with the different data collection on the ship: Multibeam sonar, 3.5 kHz Echo-sounder and Magnetometer. Best way to keep ourselves busy until we reach the first site.